VIN# KM518182. Two or more at this price. Lease for 39 months with $0 down or lease for 39 months for $1,995 down plus first month's payment, tax, tag, license, dealer and acquisition fees due at signing. No security deposit required, with approved credit. 10,000 miles per year. Extra fees may apply at lease end. 1.9% APR financing for 72 months at $14.71 per months per $1,000 financed. See dealer for complete details. Expires 4/30/19. VIN# KF117410. Two or more at this price. Lease for 39 months with $0 down or lease for 39 months for $995 down plus first month's payment, tax, tag, license, dealer and acquisition fees due at signing. No security deposit required, with approved credit. 10,000 miles per year. Extra fees may apply at lease end. See dealer for complete details. Expires 4/30/19. VIN# KC508913. Two or more at this price. Lease for 39 months with $0 down or lease for 39 months for $995 down plus first month's payment, tax, tag, license, dealer and acquisition fees due at signing. No security deposit required, with approved credit. 10,000 miles per year. Extra fees may apply at lease end. See dealer for complete details. Expires 4/30/19. VIN# KA011784. Two or more at this price. Lease for 39 months with $0 down or lease for 39 months for $1,995 down plus first month's payment, tax, tag, license, dealer and acquisition fees due at signing. No security deposit required, with approved credit. 10,000 miles per year. Extra fees may apply at lease end. See dealer for complete details. Expires 4/30/19. VIN# KM230940. Two or more at this price. Lease for 39 months with $0 down or lease for 39 months for $1,995 down plus first month's payment, tax, tag, license, dealer and acquisition fees due at signing. No security deposit required, with approved credit. 10,000 miles per year. Extra fees may apply at lease end. See dealer for complete details. Expires 4/30/19. VIN# KM725300. Two or more at this price. Lease for 39 months with $0 down or lease for 39 months for $3,995 down plus first month's payment, tax, tag, license, dealer and acquisition fees due at signing. No security deposit required, with approved credit. 10,000 miles per year. Extra fees may apply at lease end. See dealer for complete details. Expires 4/30/19. VIN# K9685574. Two or more at this price. Lease for 39 months with $0 down or lease for 39 months for $1,995 down plus first month's payment, tax, tag, license, dealer and acquisition fees due at signing. No security deposit required, with approved credit. 10,000 miles per year. Extra fees may apply at lease end. 0% APR financing for 72 months at $13.89 per months per $1,000 financed. See dealer for complete details. Expires 4/30/19. Simply amazing! The showroom is breathtaking. The staff is second to none. 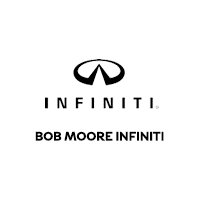 Excellent service at Bob Moore Infinity! My service advisor Tommy was professional and courteous and the girls at the cashier desk . My repair went well and my car was clean and ready when promised. I would recommend Bob Moore service department! I hadn’t bought a vehicle in years. A friend told me to see a salesman with the fedora named AJ. I want to say that this guy was one of the nicest and knowledgeable guys I had ever met. He treated me as if I was coming in to purchase the large Infinity for 90 k and I was only looking for a Challenger. He worked with me for 3 days and did not haggle or press me. I had made my mind up to buy a car that had miles and by the 3rd day I had convinced myself to get a better Challenger with less miles on their used Subaru lot. AJ worked with the Subaru manager Charles and we struck a deal on a better Challenger. He too thanked me for my business. AJ was top notch and his Team Leader @ Infinity was a gracious person too. My car buying experience was the greatest and I will refer any customers looking to purchase new or used to Bob Moore and to be sure and ask for AJ with the fedora. All that I dealt with were very professional. I’m glad Angela referred him to me. Fast, friendly, clean and bright environment. Everyone here at Bob Mooore is very accommodating, we made our purchase from another city and everything went great.Jeff, Blane, Larry and of course McKenzie thank you again for all of your help my wife loves her Qx50 essential. Bob Moore INFINITI is your local INFINITI dealer in Oklahoma City where you’ll find exactly what you’re looking for. Here at Bob Moore INFINITI we care about our customers and want to make sure that they are getting exactly what they want and not settling for something else. We have a large selection of new and used cars and SUVs, as well as trained service technicians and experienced finance professionals. Come see what we have to offer today. Be sure to browse through our online inventory to find what you need. We are standing by and ready to help. Are you on a tight budget or just looking for a great offer? Here at Bob Moore INFINITI we are proud to carry an inventory full of used and Certified Pre-Owned INFINITI cars and SUVs. We are your premier destination to find used cars in Oklahoma City and we have something for everyone to choose from. The Bob Moore INFINITI pre-owned selection also includes cars for under $10,000 for those who are on a tight budget. Here you’ll only find the highest quality pre-owned cars and SUVs that are a part of our INFINITI Certified Pre-Owned Program. Gain exclusive benefits when you buy Certified with INFINITI. Stop by today or browse online for a great offer on a pre-owned INFINITI vehicle. We make INFINITI financing easy here at Bob Moore INFINITI. We have a full staff of finance professionals that are prepared to help you through every step of the car buying process. Our team will make sure that you receive the best offer possible and ensure your experience is the best you’ve ever had. Looking to trade? Use our convenient Value Your Trade tool to view the market for your car today. At Bob Moore INFINITI we offer competitive rates and car leases in Oklahoma City. You can get started with the finance process by either calling our finance center or filling out an application online. Don’t hesitate to start the process of finding your dream car. When you’re INFINITI needs service the best place to bring it is where you bought it. Our INFINITI Service Center has factory-trained technicians that will handle your car or SUV properly. You can be sure that your vehicle is in good hands and that the job will be done correctly the first time. Here at our INFINITI Parts Department, we use genuine INFINITI parts and accessories to ensure that they are the perfect fit for your car. You can even schedule your next appointment, order parts, or check for any recalls right here on our site. Have some peace of mind knowing that your vehicle is in good hands at the Bob Moore INFINITI Service Center.